Dandruff is a common hair and scalp problem that hassles most people at some point in their lives. The condition is seen commonly in people who have seborrheic dermatitis, a skin condition that causes excessive oil production in the scalp. Sometimes, other conditions like psoriasis and yeast overgrowth can also lead to the skin condition. Whatever the cause, dandruff can cause discomfort and be embarrassing, especially if it shows on the hair. Dermatologists prescribe shampoos with zinc and ketoconazole to control dandruff. But some home remedies for dandruff can work just as well. One of the best home remedies for dandruff is lemon juice. This week, we'll see how lemon juice can fight dandruff. How Fenugreek Seeds Can Prevent Hair Loss, Dandruff And Promote Thick Hair Growth. Lemon juice is a natural remedy for balancing the pH of the scalp, which is important in order to control the fungus that causes dandruff. Lemon juice is also full of antioxidants, vitamin c and citric acid that can promote healthy hair growth. It also has antifungal properties that fight the dandruff-causing yeast Malassezia globosa. It also helps in dislodging the dead skin cells that pile up on the scalp, worsening the dandruff. 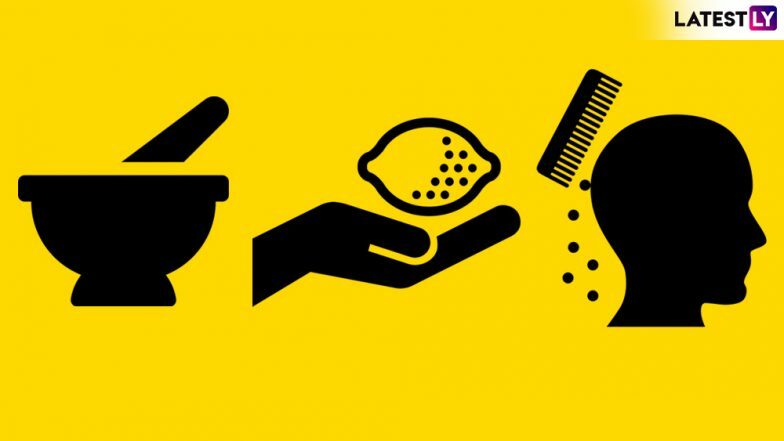 All these reasons make lemon juice an effective ingredient to fight dandruff. Hair Growth Home Remedies: 8 Superfoods That Will Make Your Hair Stronger, Longer and Healthier. To use lemon juice against dandruff, all you have to do is apply it to the scalp either alone or mixed with other dandruff-fighting ingredients like tea tree oil, coconut oil or apple cider vinegar. Juice an entire lemon and add a tablespoon of coconut oil. Mix it thoroughly till the two become emulsified. Now apply this mixture to your scalp and let it stay for 20-30 minutes. Now wash your hair as you do always with a good shampoo and conditioner. Within days of using it, you will see a marked difference. But before you try it out, remember that lemon juice can be acidic and cause irritation to sensitive scalps. In that case, either consult a dermatologist or conduct a patch test.